Last year, we added Custom Fields to LinkedIn Recruiter to help you keep track of proprietary candidate information such as work authorizations or desired salary. Many Recruiter users found Custom Fields helpful to capture and organize customized information, but in order for them to be really useful, Recruiter users wanted to search them at a later date. 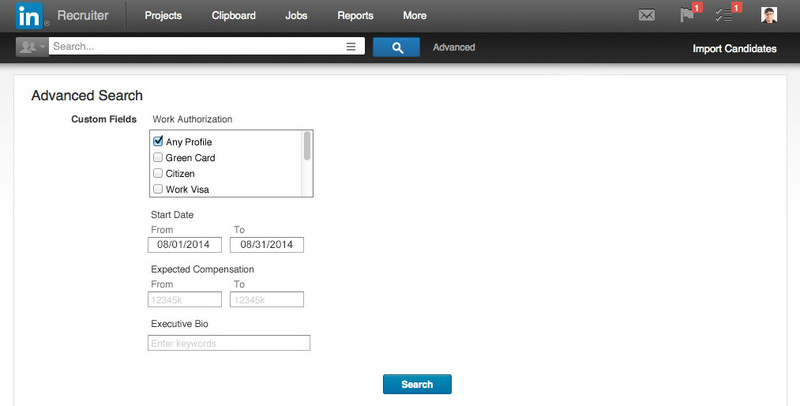 That’s why I’m excited to share that we’ve made Custom Fields searchable in LinkedIn Recruiter. Here’s an example of how to use custom fields to save time and zero in on the right candidate more quickly. Imagine that you just heard back from a strong prospective candidate named Kevin, and he’s interested but he’s involved in a project until August. You can use Custom Fields to note his availability date on his Recruiter profile – ensuring you know when he’s ready to chat again. Fast forward to August, and you have an open position but you’ve long-forgotten Kevin’s name and don’t know how to find him. Now you can simply open Recruiter’s advanced search page, enter a date range search between August 1, 2014, and August 31, 2014, in the Availability Date custom field and Kevin’s profile will pop up. If you haven’t yet taken advantage of custom fields, your administrator can create them by clicking on ‘add fields’ from any Recruiter profile page or visiting the ‘Admin Settings’ page within Recruiter. To start, use the suggested custom fields, such as work authorizations and willingness to relocate, or create your own. For example, if you recruit for government agencies you may want to create a agencies is to create a security clearances field. The possibilities for Custom Fields are endless, which is why I’m excited that they are now even more powerful because they are searchable. I hope Custom Fields make you even more productive by helping you quickly search and find the right prospect that’s already in your pipeline. Enjoy!